Low-Prep Review Game: ¡Mi Lápiz! ¡Mi Lápiz! is a review game known by many names. Some people simply call it, “The Dice Game”, others call it “¡Seis!”, or “Surrender in Seis”. I realized that what my students tended to say most when they were playing was something along the lines of, “MY PENCIL”, so I decided to try changing the name to match, and now that’s all you hear! I first learned of this game from a Youtube video someone had posted on one of my social media feeds, and I just had to try it! There’s almost ZERO set-up, but the engagement is huge! The point of the game is to be the first to complete the sheet/set of questions correctly. There is only one pencil, because only one person may write at a time. Begin with the pencil in the middle. Take turns rolling the die. The first person to get a six gets to take the pencil and start writing. Everyone else continues to roll. AS SOON AS someone else gets a six, they get to take the pencil and start writing. That’s it! Sometimes I will set this on a timer and only let them play for about 8 minutes, but we have played for 40 before and they were not happy about calling it quits when the bell rang! If I can tell the game is dragging, or the excitement wavers for a moment, I’ll throw a giant timer up on the board and let everyone work for a minute, then resume the game. Olivia Smith mentioned that she will add another number for more variation – say if they roll a 2 they get the pencil, BUT they have to write with their non-dominant hand! Remember, the first person to complete the sheet CORRECTLY wins – so as they finish, I check their answers and give them some feedback. Sometimes there’s a huge upset because they worked too quickly and made a mistake, sacrificing valuable pencil time to the other player(s)! I usually keep the worksheet length short – think around 15-30ish questions that are fill in the blank. Longer sentences are tough, because sometimes the pencil will get snatched out of their hands mid-sentence and they’ll forget what they were doing! Here’s the link to the Slides I use to intro and run this game with my students! Looking for more review game ideas? Check out El Toro! I hope your students love it!! Thank you so much for sharing this, I really appreciate it! 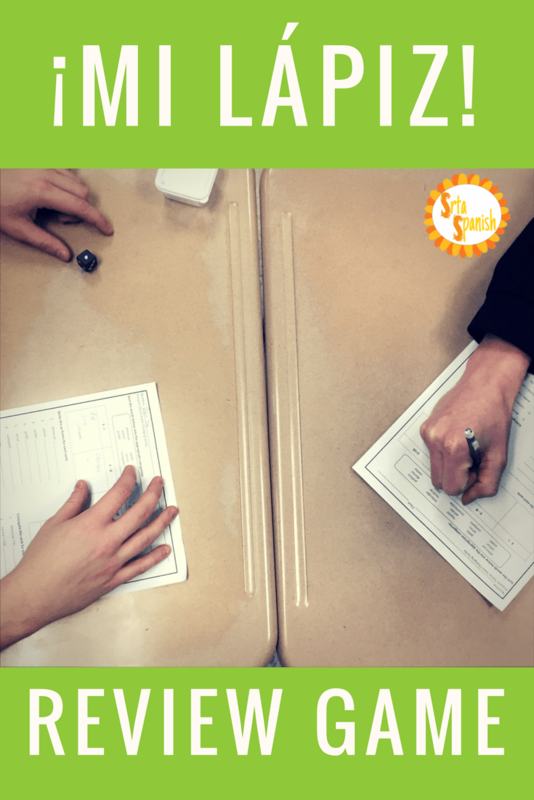 I can always use a new review game to freshen things up in the classroom. What type of questions do you put on the review? Vocabulary or verb conjugations? Yes! Both, or either of those. Most importantly I’ve found short answer/quick recall to be the best kind of question for this activity. Longer answer or more in-depth questions are hard because they get interrupted when someone steals their pencil! ¡Muchas gracias! This is a wonderful idea and game. Thank you so much for sharing! I’m so glad you like it! I love that it’s basically zero prep! LOVED this. Made my day so much better! Thank you! ¡Gracias por toda la información fantástica! Would it be at all possible to include a menu of categories on your blog where your posts are linked again by group, ie. Games, CI, Reading, Videos, etc…? It would be a nice way to navigate your blog when I am not checking in for the latest post. Thanks for all you have shared! That’s a great idea! I know right now the posts get tagged for those categories – I believe if you open one of those posts and click on the categories it will take you there, so that might be a good option until a website re-design can happen!